Islamophobia is very much also seen in documentaries produced around the world. Many of these "so-called" documentaries focus on the perceived controversial aspects of Islam, and report them as cold harded fact. These documentaries center around the theme that Islam is bad, and that Muslims in general should be feared. They quite often times misrepresent or misinterpret information or facts to reinforce the the propaganda that Islam is bad. Below are two examples of documentaries that paint Islam and Muslims in a negative light and attempt to convience their audiences that they should be very fearful of Islam. 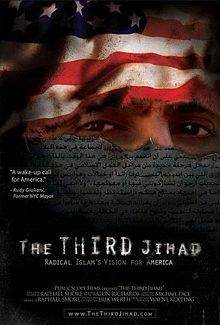 The Third Jihad is a documentary film that claims that Muslims and Islam is waging a cultural jihad against western societies. It maintains that Muslims around the world seek to undermine western cultures and western ideologies. They believe that all Mulsims are subscribers to strict Islamic law, and seek to convert or destory all non-mulsims. This documentary asserts that although there is a violent jihad that Muslims are engaging in, they are also engaging in a cultural jihad. That is a jihad that seeks to subvert all the western ideologies and cultural identities that western and christian people maintain. Innocence of Muslims is a film/trailer that was made in 2012. In the film, it portrayed Muhammad and Muslims in a very inaccurate and negative light. Throughout the film, the producers took care to purport this negative feeling for Islam, and produced a film that is filled with many inaccuracies about Islam in general. The Muslims within the film are seen as very backwards and against christanity. The Muslim characters in the film are seen destroying christian homes and property and are labeled as Islamic terrorists. Upon release of this film, there was a huge outcry by the Muslim population. They viewed this film as a gross misrepresentation of Islam, and Muslims during the period of Muhammad. They saw the characterization of Muhammad as extremely offensive, and felt that this film further complicated matters when it came to the misunderstanding of Islam.